We called it the garage, but it was really an old shed. It was in the back yard of the house where I lived as a child. A few years ago, my niece, Donna, who is super-talented – just like her siblings and their mother, did this sketch of the old shed. 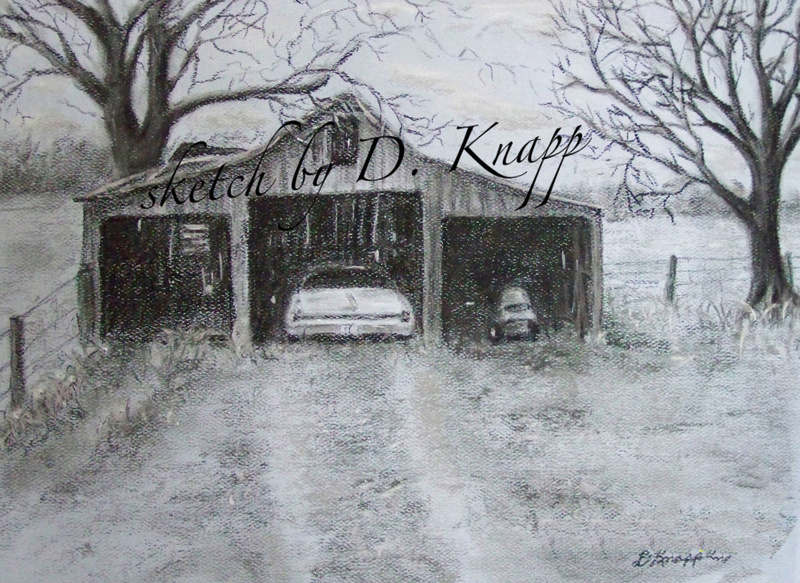 Although my Mom’s car and riding lawn mower weren’t in the picture Donna went by, she added those into the sketch! I told you she was talented. I love this sketch. For some reason, seeing the trees and the fence along the back of the shed just brings back so many memories. 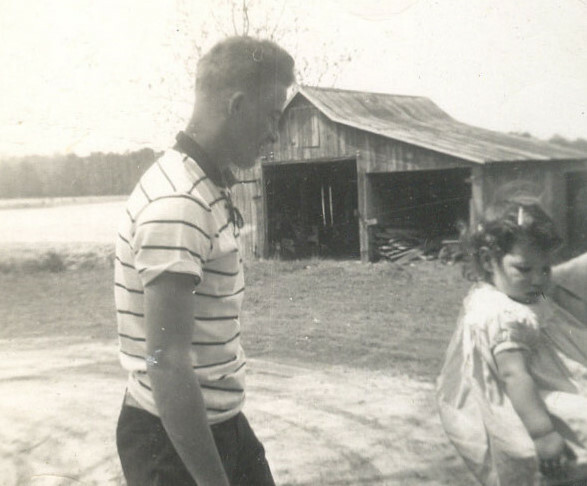 Since my nieces and nephews were around my age, we all played together as children. A lot of our time was spent playing in this old shed. It had a loft, but I was always too afraid to do more than just peek up there from the safety of the ladder. I’m not sure how much time my nieces and nephews spent up there, but they weren’t afraid to venture off the ladder like I was. This picture was taken when I was about a year old. That’s my late brother-in-law, Ed (Donna’s dad). And there’s the old shed. The shed was torn down years ago, so I’m glad we have this photo. Most of my memories of times spent there are good ones. But one day, that shed – or rather, the contents of it- got us in trouble. My daddy once had a workshop in the old shed. And there was a vise in his workshop. One day, when we were children, my nephews and I decided it would be really cool to crush black walnuts in that vise. I’m sure it was one of my nephews who came up with the idea. I can say this with certainty because neither of them is on this blog to defend himself. Our mothers were NOT happy about the decision to crush walnuts, since it resulted in us having walnut stain all over our hands. And nothing, NOTHING, they tried would remove that stain. As children, we’d never heard about walnut stain. We learned pretty quickly how permanent it is. Well, I guess semi-permanent, since it did eventually wear off. I don’t think I ever went near that vise again. And if I did, you can bet I didn’t crush walnuts in it.